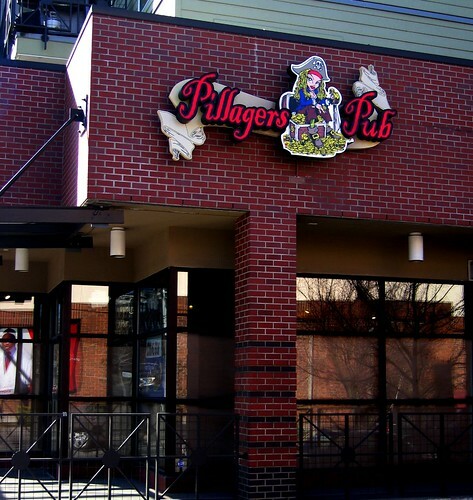 Pillagers Pub will open to the public this Friday in Seattle’s Greenwood neighborhood. Doors open at 3:00 PM. The new “brew pub” (see below) will have an unmistakable pirate theme. I stopped by today and, though the windows were still papered, I was able to catch a thin glimpse of the mural wall depicting a pirate battle. Aye, she looks to be a right jollyboat for sure! Argh! Pillagers Pub - At the corner of Greenwood Ave. North and 87th Street. Jeff Smiley, owner of Baron Brewing, is the scallywag behind all of this addled bilge. As we originally reported here, Baron Brewing (long recognized for its dedication to German style beers) recently expanded its offerings and began making ales. They branded the ales 3 Skulls and produced Black Bonney Porter, Pillagers Pale, and Cutthroat Red (my favorite). Pillagers Pub will feature beers by Baron and 3 Skulls. There will not be a brewery on premises, but the affiliation with Baron and 3 Skulls is undeniable–Jeff Smiley and his wife are the owners of Pillagers Pub. Pillagers is a new kind of brew pub. Changes made in 2008 to Washington’s liquor laws allow breweries to have an off-site pub. Previously, in order to be a brew pub, the pub had to be attached/adjacent to the brewery. Essentially, the new law states that for each brewhouse (the part of a brewery that actually makes beer) a brewery can have one off-site pub. That is a gross oversimplification, but I think you get the point. Location – Pillagers Pub is at the corner of Greenwood Ave. North and 87th Street. It is kitty-corner from Safeway. The location was a Tully’s in its previous life. Yes, it is practically right across the street from Naked City. Hi, I was kicked out of Pillagers pub, because I was disputing by bill. I politely pointed out that my wifes, taster beer was being charged $3 though the menu was a 1.25/1.50?. Anyways the bartender who said his name was “Mr. Harrison”. Became bullish with and aggressive as if I was doing something wrong after I said I was not going to sign my credit card statement. and he kicked me out. Believe it or not my bill was $4.50 for a coke and 6 ounce taste of a beer, I had the coke. Yes I know it a small amount, but there are ethics involved. This guy was hot headed and apparently does not want to work very long in the restaurant industry. I buy a lot of good beer and have no trouble paying for what I expect on a bill, but to be kicked out of a $1.50- this guy must be nuts. Anyways, I expect an apology from someone and I will dispute my credit card bill. Yes again I know it’s $4.50 but any establishment that treats its customers like this doesn’t belong in business. This is your source for everything beer in the evergreen state. Got news for us to report? Wondering what it's all about? This video will explain RSS in plain English. This video will explain Twitter in plain English.